Israeli Naval commandos, Shayetet (Squadron) 13, on Wednesday 03/05/2014 morning, intercepted a ship named Klos-c and operated by Iran, in the Red Sea weighed down with missiles that was en route to the Gaza Strip (probably to the Palestinian Islamic Jihad) the IDF said in a statement. The boat, named Klos-c, sailing under a Panamanian flag, was stopped by the elite naval commando as it was heading north near Port Sudan, 1,500 miles South from Israel. 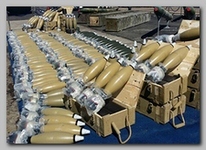 Once on board the Klos-c Israeli soldiers found cement bags, behind which were hidden dozens of M-302 missiles which, the IDF said, were loaded onto the boat in Iran. Had the boat reached the Port of Sudan, its next stop would have been the Gaza Strip (see – PORT-SUDAN Bombing). The M-302 missile is made in Syria and is based on Iranian technology, Israel’s Wallareported. M-302 missiles have a range of up to 200 kilometers and were used during the Second Lebanon War in 2006 to bomb several Israeli cities, including Haifa. The IDF was closely monitoring the ships movements since it left Tehran some ten days earlier. Iran, Israel claimed repeatedly, violates Security resolutions 1747 and 1929, which forbid it to export any kind of military material. These two resolutions clamped sanctions on Iran because of its nuclear program. If. indeed, the weapon was intended to Gaza Strip it is also a violation of Security Council resolutions 1373 and 1860. Security Council resolution 1373 is a counter-terrorism resolution adopted two weeks after the 9/11 attacks and aimed at hindering terrorist organizations, and 1860 was adopted during Operation Cast Lead in 2009 and called for an immediate cease fire ( see also the 01/2002 – Karin A weapon ship). The Israeli Foreign Ministry said. “Smuggling is carried out by the ‘Quds Force,’ which is part of the Revolutionary Guards”. 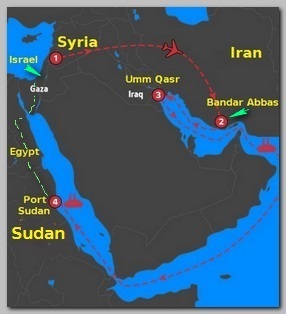 According to the Israeli Defense Minister Moshe Ya’alon in a press conference on 17:00 the same days the missiles were manufactured in Syria in order to avoid Iranian fingerprint of the shipment and the Klos-c sailed initially from the Iranian port of Bandar Abbas at first to the Iraqi port of of Umm Qasr to mislead any possible trail about the final destination of its cargo. The Israeli Minister also said Iran tried to revive its route to smuggle weapons to Gaza Strip from Port Sudan (see – Secret-War). The route used in the past goes from Port Sudan through the uncontrolled Sudanese border with Egypt, then with boats through the Suez gulf to Sinai Peninsula (see – Sinai Junction), now partly uncontrolled by the Egyptian Army where Bedouin tribes and Al Qaeda affiliated organization are very active. From Sinai Peninsula the weapons were smuggled to Gaza Strip through the Rafah Tunnels. In April 2013, the Egyptian navy seized a vessel carrying a large arms shipment near the Sinai Peninsula’s southern coast. The Anatolia Turkish News Agency reported the ship is an Iranian fishing vessel named “Sawit 1″ and reported that 62,283 firearms were found in its cargo, including sniper-rifles, AK-47s, RPGs and large quantities of ammunition. On 03/10/2014, Israel put on display in Eilat harbour 40 M-302 surface-to-surface rockets with ranges of 50 to 100 miles, more than 181 mortar shells and about 400,000 rounds of ammunition, according to the Israeli military’s count.